Large canvas tents are ideal for long-term living. A camping tent is an effective shelter that may be used as a home. Living in a tent requires a commitment to a lifestyle change and the ability to accept a simplified approach to your daily routine. The tent is difficult to heat in the winter but a quality design will keep you dry and protect your valuables from the elements. 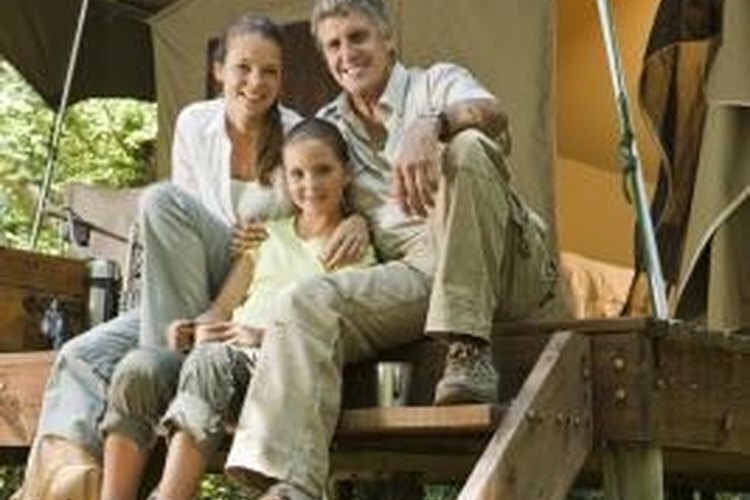 It is important to choose a sturdy design and maintain your tent to make it a comfortable home. Erect a canvas wall tent or yurt for long-term living. Make sure the tent material is durable and the design allows you to use sturdy metal poles. Tents made of thin fabric with graphite poles will not withstand long-term abuse from the elements. Install a floor in the tent or erect the tent on a deck or other hard surface. You can live in a tent without a floor, but mice may tunnel inside during the colder months. Raising the tent off the ground and sealing the edges will prevent an infestation. Add a wood-burning stove. Split and store wood beneath the deck or in a dry area. Split the wood during the summer and allow it to dry for the winter. You may also insulate the canvas walls to retain more heat in the winter. Build an outhouse or create an area for a composting toilet outside. You also can install a toilet inside the tent and ventilate it to the outside. Add a large water storage container inside the tent. Stockpile canned food if your tent is in a remote area where you may become trapped by snow. Store the food outside in an animal-proof container. Maintain cleanliness around the tent area. Remove trash immediately and clean up food scraps to prevent attracting animals. Animals may attempt to find entry into the tent if food is present. Living in a tent requires preparation and determination. It is not an easy lifestyle and you must be prepared to make the sacrifice. Consider purchasing a gym membership if you are camping long-term. The gym will offer you a place to shower and relax when you need a break from the tent. Living in a remote tent requires you to stockpile necessities and be prepared for the worst. Keep a back-up shelter packed away in case the tent becomes damaged.